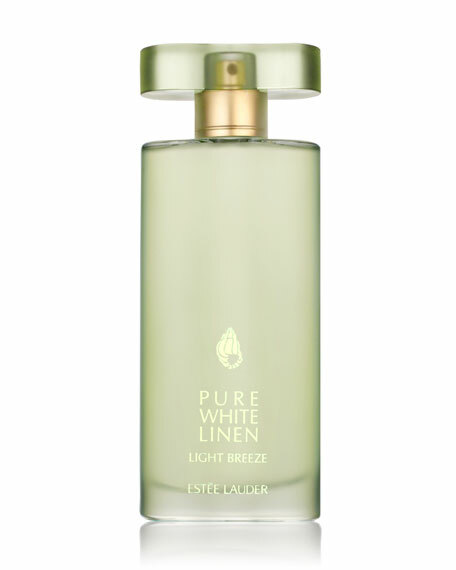 Estee Lauder Pure White Linen Light Breeze, 1.7 ounces. Top Notes: Sparkling Breeze Accords. Signature accents comprised of Darjeeling Tea blended with mesmerizing citrus accents of Bergamot, Orange Zest and White Grapefruit suggest a youthful and effervescent freshness. Watery Kumquat enhances the freshness with a modern and delectable fruitiness. Middle Notes: Vibrant Breeze Accords. The floral heart is a blend of radiant Yellow Freesia petals entwined in Osmanthus, Linden Flowers and a veil of silken Rose petals, to embellish the signature freshness. Base Notes: Lingering Breeze Accords. Luxurious Teak Wood fused with Cedarwood and a Soft Skin Accord provide sensuality, richness and a lingering impression to the background. A drop of precious Acacia Honey brings a sense of luxurious softness.